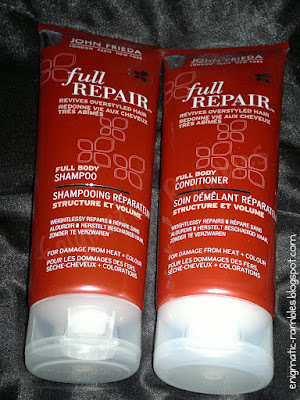 According to John Frieda this is the repair stage; "The Full Body Shampoo and Conditioner contain patented technology. 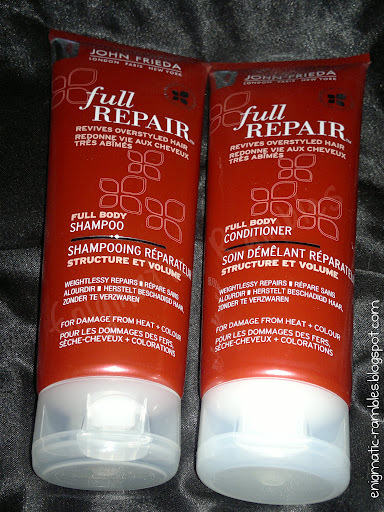 Used together the formulas help to repair both the internal and external structure of the hair resulting in a flawless, full-bodied style"
The claim of repairing the structure of the hair is a bit misleading. It's not possible to repaira ir once it has split, however you can give your hair the appearance of a repaired structure. Inca Inchi oil - Is in the entire range, basically what it does is help the hair to look less damaged by binding the split ends together. It also coats the hair in order to protect it from any heat damage you might want to inflict on your hair in the process of making it look amazing! Neither of these products leave your hair feeling weighed down, which is good seeing as it can be quite difficult to moisturise your hair without leaving it feeling limp. I would recommend these to try as they aren't a bad product, just don't expect a miracle. I won't be repurchasing these because I don't think they did anything special to my hair. I actually bought these two items myself before I was sent a further set to review. can someone please tell me why i've never used john frieda before? (or i forgot?!) i just feel strange with that company ... but this does not sound too bad!